Here’s a spicy twist to your ordinary clam chowder! 1. Heat oil in a large saucepan over medium heat. Add onion, poblano peppers, and garlic and cook until tender, about 5 minutes. Place mixture in a food processor or blender along with 1 cup of the corn and about ½ cup of the chicken broth; process until smooth, adding more broth if needed to puree thoroughly. 2. Pour mixture back into saucepan and stir in remaining broth; cover partially and simmer over medium-low heat for 30 minutes, stirring often. In a small bowl, mix the masa harina with water, making sure there are no lumps; stir into soup and continue stirring until soup thickens, about 5 minutes. 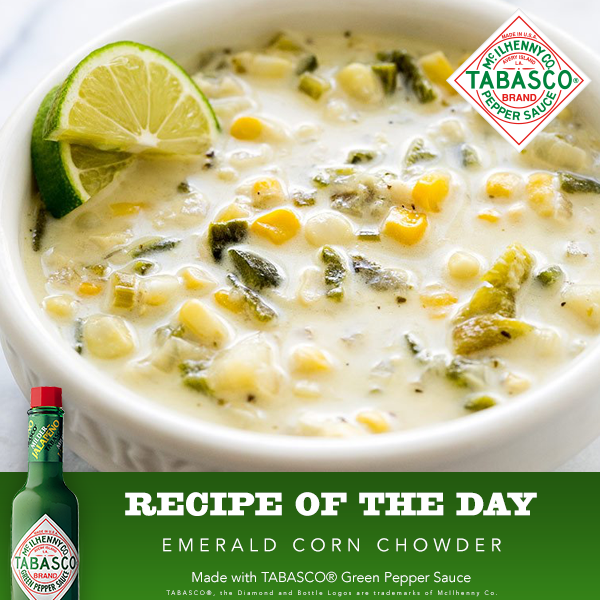 Stir in cream, the remaining 1 cup corn, TABASCO®Green Sauce, and salt. Return to a simmer; remove from heat and stir in cilantro. Some are really helpful information in there. It is extremely decent to see your site. I get a kick out of the chance to share these sorts of articles to my friends who like to read the websites for increasing great contemplations and information. Here you can check my best essay writing service to having a wonderful support for your composing works.